Salt & Habanero / Scotch Bonnet peppers (to taste). 1. Start cooking the shaki first with as little water as possible (see video below) as it is the toughest meat in the bunch. This soup should have as little water as possible so add small amounts of water at a time and top it up as you cook. 2. When the shaki starts to curl, add the dry fish and stockfish. 3. When the shaki is almost done, add beef, stock cubes and some of the onions and cook till all the meat and fish are well done. Set these aside. 4. In another pot, pour the palm oil and heat it up. Once hot, add the remaining onions. 5. Fry the tatashe peppers till there's no more water in it. This should take about 15 minutes. 6. Add the locust beans, crayfish, and stir very well. 7. Add the cooked meat and fish, stir very well. 8. Add the vgetables, stir very well, cover and once it heats up again, add salt to taste and take the pot off the stove. 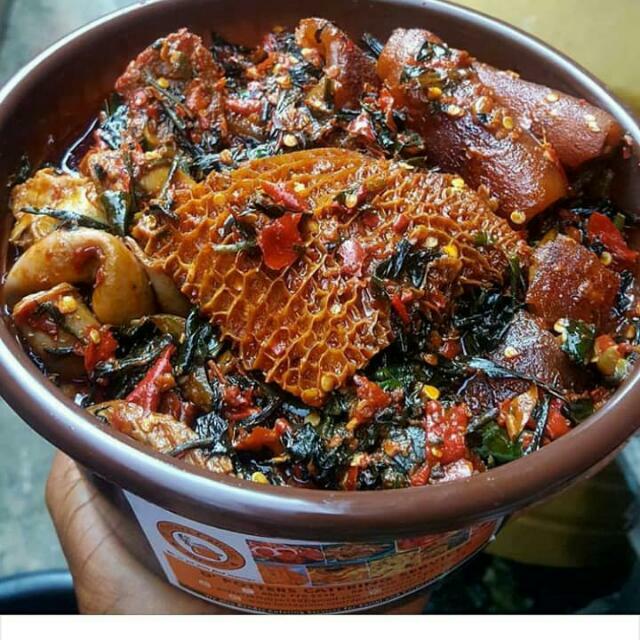 Serve Efo Riro with Semolina, Amala, Pounded Yam , Eba or any other fufu meal. It also goes well with boiled white rice.